During the last week we had some filming work for a client in Scotland. The subject matter - a sport rather different to our usual thing, but good fun none-the-less, and always a revelation to see how much easier filming can be when you are not hanging off ropes and battling with the elements. Then on Saturday we had a date with the BBC, or more accurately the BBC had a date with us. They wanted to do a 5 minute ‘magazine’ item about our business Hot Aches Productions, focusing particularly on the success of E11 and also our new film Committed due out later this year. So producer Margaret Wicks plus camera crew arrived early on Saturday. First shoot was at our Haymarket ‘studios’. Oh dear. We’re not used to being on this side of the camera, not quite sure what rubbish we came out with! 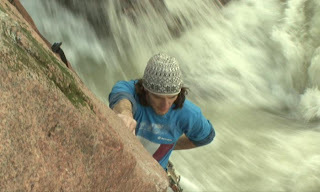 Some of the filming focussed on us editing up last week’s sea cliff climbing footage. 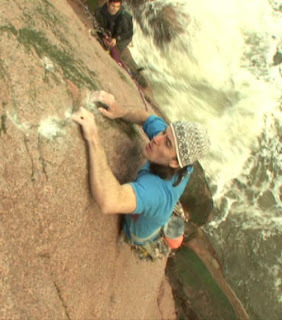 The tense footage of MacLeod on-sighting his E7 with a broiling sea threatening to engulf the belay is really dramatic. This will be the first sneak preview from the new movie to be broadcast. It was an interesting exercise and reinforced what we always knew, namely that our rightful place is very strictly behind the lens.